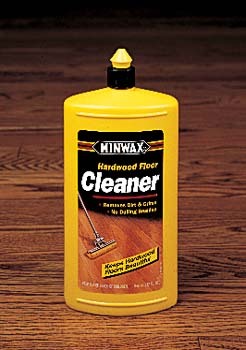 DiscountPaint.net :: MANUFACTURERS :: MINWAX :: MINWAX 62127 HARDWOOD FLOOR CLEANER SIZE:32 OZ. MINWAX 62127 HARDWOOD FLOOR CLEANER SIZE:32 OZ. Specially formulated to help maintain the natural beauty of hardwood and laminate floors. Minwax® Wood Cleaner is not for use on waxed, oiled or unfinished wood or wood finished with shellac. 1.Sweep or vacuum to pick up loose dirt. 2.Use Minwax® Hardwood Floor Cleaner directly from the bottle. No mixing, diluting or rinsing is needed. 3.Squirt cleaner lightly in an "S" pattern directly onto floor in a 3 to 4 foot area. 4.Mop floor, using a damp, well wrung-out mop. Rinse mop as needed during cleaning to remove dirt from the mop. Note: Use Minwax® Hardwood Floor Cleaner frequently as part of your regular cleaning routine. Use doormats and area rugs by door entries to help keep dirt, sand and grit from entering the house. Install furniture glides to protect against scratches and gouges. WOOSTER 4050 THE STAINER BRUSH SIZE:6" PACK:3 PCS. OLD MASTERS 92510 SEMIGLOSS SPRAY SPAR MARINE VARNISH SIZE:13 OZ. SPRAY. SEAL KRETE 402002 CLEAR GRIP NON SKID ADDITIVE SIZE:3.2 OZ. SASHCO 10020 IRONSTONE BIG STRETCH SIZE:10.5 OZ. PACK:12 PCS. MINWAX 42730 WOOD FINISH BRUSH SIZE:2 1/2".